It’s embarrassing to admit that as of this afternoon, I’ve spent at least $50 of my hardly-earned money to watch the film A Star Is Born in the theaters. Four times now, I’ve gone off to watch this melodrama on purpose. The last time I went, I got inspired and dashed out to catch a 9:45 showing–one that turned out to be a private viewing. I was the only soul in the theater until after midnight. I’m pretty sure that I’m not going to go a fifth time, but as I sat down to write, I did check to see that it just happens to be showing at 6:45 tonight at a nearby theater. Just in case. The last time I went to the theaters to see a film four times was in 1964. I was 11 years old and the Beatle’s film A Hard Day’s Night was all the rage among teens and pre-teens. It was a badge of honor to brag about how many viewings you had attended. I’m not bragging about this one. I have mentioned it quietly to a friend or two–in confidence. I felt better this morning when I stumbled across an article by Christopher Rosa that appeared in Glamour Magazine on January 11. In it, he detailed how he had spent over $100 viewing the film 8 times! The big difference between Mr. Rosa and me is that he is a huge Lady Gaga fan and speaks about her with the kind of reverence that some people only use for their mothers or certain sports figures. I, on the other hand, know who Lady Gaga is, and I’m pretty sure I saw part of her performance at the Super Bowl. If you showed me a list of her 10 greatest hits, I would not recognize any of them. That’s not Lady Gaga’s fault at all. My musical tastes have gone through periods of fossilization, and there are scores of popular artists who are a mystery to me. I went into the film with the lowest of expectations. I had a sketchy idea of what the film was about knowing only that it was a remake of a remake about a star in decline falling in love and being eclipsed by the lover he has mentored and nurtured. 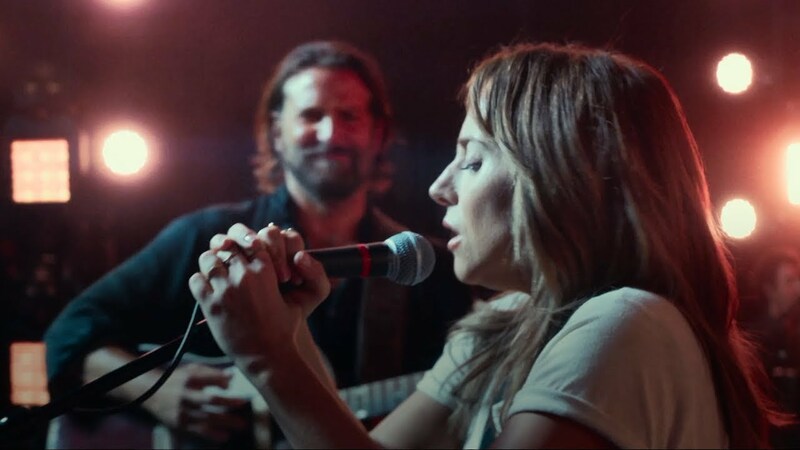 I’ve been trying to pinpoint the precise moment in the film when I knew I was hooked, and I think it may have been in the drag-bar scene where Jack ( Bradley Cooper) sings a ballad to one of the queens while Ally (Gaga) looks on, and I could feel the chemistry really begin to cook between the two of them. After all, she stands off to the side watching him, a famous, grizzled country/rock star, sing and play for one of her drag-queen friends, both respecting a place that she loves and at ease with himself and her friends. You could put Gaga in a sack and she’d look glamorous, but her down-to-earth, girl-next-door look through the first half of the film made me love her even more. Punching a cop in a cop bar and being carried out by Jack who then nurses bruised hand with tender care did nothing but add to the feeling that I was watching a great love story develop and I am a total sucker for watching two likable characters fall in love. Up to this point in the film, I realized that I was identifying entirely with Jackson Maine. I’m falling in love with Ally right along with him and feel the same sense of despair when he says his first goodbye to her a dawn out in front of her house and mumbles something to the effect, “I think I might have fucked that up” to his erstwhile driver, Phil (Greg Grunberg). Minutes later, the point of view completely shifted for me. I realized that suddenly I was seeing everything through Ally’s eyes. As Jack woos her by having his driver Phil follow her from place to place with his limo while a jet waits for her at the airport to whisk her away to his next show, I’m right there with her feeling the rush of amazement and overwhelmed by the “grand-gestureness” of it all. Sure, it makes perfect sense to quit her dead-end job, jump on the jet, and join the roadies backstage who all seem to already know her name. As she walks up on stage and takes the mic, tears involuntarily burst from my eyes–I kid you not. It’s the only moment in the film that made me cry. Even on the third viewing, that moment gave me chills. The risk she takes, the reaction of the crowd, the pride in Jack’s eyes as he watches her win the moment, just did me in. Watching their relationship develop and the artful weaving in of the concert performances carry the middle part of the film. Her performance of “Always Remember Us This Way” rivals “Shallow” for being able to create that visceral connection with the audience. But shortly thereafter she falls into the evil clutches of super-agent Rez (Rafi Gavron), and I find myself becoming just another person watching the film. Maybe it’s a defensive posture, knowing that my buddy Jack is going to continue to spiral both personally and professionally, and that Ally is going to rise to stardom, now transformed into a pop diva. These two things have to happen because that is the story of A Star Is Born. Gaga’s stirring finale, her performance of “I’ll Never Love Again” is worth waiting around for, even if your are the only person in the audience in a theater after midnight. But by then, I’m already looking forward to the next time I’ll get to go on this emotional rollercoaster. And yes, there will be a next time.